Illinois allows students to earn dual credit in academic and/or CTE dual-enrollment coursework through their high school, postsecondary institution, online, or at another venue such as a career center. Public postsecondary institutions are required to accept these credits (Education Commission of the States, 2015). The Center for Native Education established two Early College High Schools as part of the Early College High School Initiative (ECHSI). More information about schools participating in ECHSI is available at the ECHSI website (Jobs for the Future, n.d.). ASPIRA Early College High School was established by ASPIRA, Inc., of Illinois. More information about ASPIRA Early College High School is available at the ASPIRA website (ASPIRA Early College High School, n.d.). 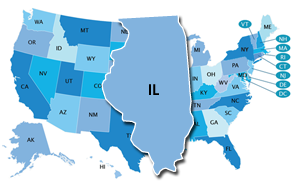 Within these areas, Illinois implements programs of study within each of the 16 Career Clusters (National Association of State Directors of Career Technical Education Consortium, n.d.). Illinois does not have a statewide system for career exploration or career plans at the K–12 level. The above requirements went into effect starting with students who entered the ninth grade in the 2008–09 school year. Illinois may have a state-specific Early Warning System, but the system is not publicly available.